The terrace of Villa 1404 is the perfect place to relax and soak up the beauty of Cabo San Lucas. The spacious private terrace features full resort garden and pool views, views of the Sea of Cortez and, of course, the Famous Land’s End. Located on the 4th floor, this 2 bedroom, 3 bathroom beautifully appointed villa features a full kitchen with granite countertops, a spacious dining area for 6, and a living room perfect for relaxing together. Both bedrooms have been stylishly decorated and both enjoy direct access to the terrace. The master bedroom, with a king bed, TV, DVD player and additional seating also features a spacious en suite with jetted tub, granite dual vanity, large stand-up shower and plenty of closet space. The second bedroom, equally as spacious, includes 2 queen beds, TV, DVD player and en suite. For your convenience, La Estancia villa 1404 also features a third bathroom and washer and dryer off of the living room. La Estancia Vacations has been crafting dream vacations for over 20 years. From selecting the perfect villa to dinner reservations and activity planning, the La Estancia Vacations team is there to help. Competitive pricing, a personalized approach and one-on-one help is what it's all about. We look forward to matching you to the perfect villa and helping you "Find Your Cabo." Villa La Estancia Los Cabos in an incredible upscale resort property located on the beautiful Medano Beach. 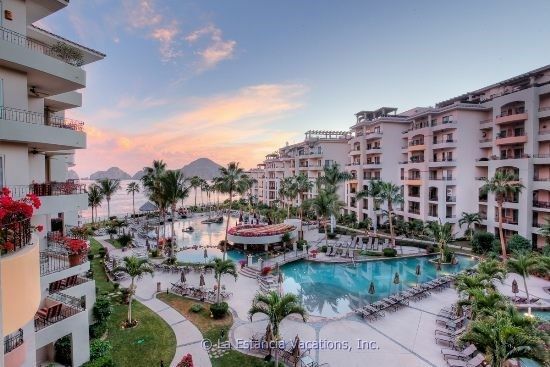 Every unit at Villa La Estancia is water facing, which means no matter where you stay you are enjoying amazing views of Cabo San Lucas' most picturesque scenery. In addition to spacious villas, the resort features a large gym, kid-friendly pool with swim-up bar, two restaurants and five hot outdoor tubs. Villa La Estancia offers direct access to the beach as well as beach lounges and shade umbrellas. When you rent with La Estancia Vacations, you get personalized service and continued support. From travel tips to last-minute assistance, we will make sure you get the most from your Cabo vacation. For all of our paradise seekers, look no further than Villa La Estancia. Enjoy your privacy, the ability to cook and eat in your villa, a private ocean-facing terrace and more. What's better than waking up to the waves crashing or watching the sky turn dark over the iconic El Arco and Land's End. We invite you to "Find Your Cabo" with La Estancia Vacations. The master ensuite features a large jetted tub, stand up shower, dual granity vanity and large closet with a safe for your valuables. Dining table on the terrace also. The villa was beautiful, plenty of space for our family of 5. The resort was quiet, relaxing and everyone loved the swim up bar :). It’s a short walk on the beach to town where we enjoyed some local restaurants. On our snorkeling cruise we saw whales on the way back which was exciting and unexpected. We’d highly recommend this location to others and the owners were accommodating and nice to work with! Thank Sara! We are so glad you had a great time! We loved taking care of you and hope to see you in the not too distant future! Thank you Malcolm for arranging our villa. We had a wonderful week. The villa was perfect and the resort was amazing as always! I am so glad and now that you are part of the LEV family we look forward to taking care of you again! Wonderful location with amazing views. Loved the unit and the resort. Pool very nice, didn't go to beach. Would highly recommend renting. Thank you so much! We are so glad you enjoyed your Villa and Estancia! Come back and let us take care of you again! Vicki and Malcolm could not have made our booking experience any easier! They were prompt with their responses, gave many tips on where to dine and things to do, consistently reliable and professional. Condo was spacious and very clean. Nice bathroom amenities too. You won't go wrong booking with Malcolm and Vicki. They are wonderful! Jerilynn it was such a pleasure having you as our guests! Thanks so much for your kind words. It is so important to us that you have a memorable experience , not just a fabulous place to stay! We are so glad you had a great time and we look forward to having you back in the not too distant future! Our stay at this spacious, beautiful resort was too short! Vicki and Malcolm secured our rental dates and provided assistance with arranging our transportation from the airport, and their liaison Victor who is in Cabo was able to arrange for the resort to pre-stock our unit with everything from fresh fruit to beverages and snacks, so that we could have Happy Hour as soon as we walked in the door! We arrived to a phenomenal view of the Baja Surf from every room in the unit. The balcony was grand and ran the length of the unit, and included a BBQ and bar area as well as a lovely outdoor dining set and chaise lounges. The view and the breeze were so wonderful that we almost didn't want to leave the balcony, but the pool area and restaurants and beach access at Villa La Estancia are so lovely! The staff at this resort are the most gracious, generous, and friendly we have ever encountered. They remembered us each day, and went out of their way to see that we had everything we wanted or needed, as well as surprising us on our last day with special complimentary desserts both at brunch and at the pool. More on the unit: The master bedroom/bath suite is enormous, and the other bedroom, equipped with two double beds and ensuite bath, included a mini fridge and access to the beautiful balcony as well. The kitchen had a drip coffee maker which we had really hoped for. We didn't have enough days to actually prepare any real meals, but the kitchen seemed well-equipped. The unit had cold A/C although we really didn't need it at this time of year. The satellite TV worked great. There were some great books available to read. The unit was very clean and really beautiful and comfy. We found that the resort during the time we stayed there was quiet and peaceful. We have experienced other resorts in Mexico that play really loud music throughout the resort all weekend, so this was a pleasant discovery :-). We would definitely return to this resort and would rent this unit again. Vicki and Malcolm were very helpful in securing our rental, and Victor was available in Cabo for our every need. The resort staff was just fantastic. Viva Cabo! Viva Mexico! Viva Villa La Estancia! La Estancia Vacations made our family's Cabo vacation perfect! Our luxury villas was perfect for our family of four with 2 young adult sons. We had plenty of room and the kitchen was great for breakfast each morning. La Estancia Vacations helped us find the Villa that was just right for us and assisted with airport transfers and restaurant recommendations and reservations - they are a full service company that knows how to treat their clients. It's nice to have a big selection of villas to choose from all at once instead of trying to contact each individual owner and wait to hear back from them. Villa La Estancia is a classy resort with great staff, setting, and good food. This is the way to book a 5 star villa in the perfect spot in Cabo!